In 2017 app-based diabetes care companies are attempting to transform diabetes care services from limited point solutions to comprehensive end-to-end care programs that can be scaled with technology and AI insights. For a company to be successful at providing app-based/enhanced diabetes coaching the 4 elements need to be in place: (1) feature rich user in-app experience, (2) automated data aggregation, (3) exclusive blood glucose meter and test strip subscription offering and (4) technology assisted coaching and insights. In the next couple of years, the quality of each element will determine the winners of the diabetes mHealth app business. The diabetes app companies have had to go a long way to build their mobile platforms – the diabetes mHealth market developed in 3 stages over 8 years, with developers experimenting with various app and connected service concepts, many of which lacked a sophisticated business model behind it (read more). But today, after 8 years of product development, experimentation and limited success in app monetization, mobile diabetes care service providers finally discovered their gold – personalized, AI-assisted, data-driven coaching for PWDs. 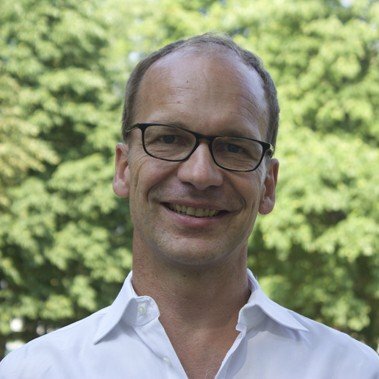 By mid-2017, key players on the diabetes digital health market- Livongo, One Drop, Glooko and mySugr shifted their focus towards offering their own unique versions of such services. Below are the 4 key elements of the product and service offerings from dominant digital diabetes care market players, and lessons learnt about how to setup a competitive offering. If you want to know more about other best practise digital diabetes care examples from other competitors tools, check out our REPORT. The promise of diabetes apps in 2017 is to assist users in tracking their data in a hassle-free (and often fun) way, analyse it, and deliver personalized data-driven insights that PWDs can easily apply in their daily life to better manage their condition. First and most importantly, any mHealth app users, not only PWDs, expect apps to offer design in line with the latest trends in the consumer-tech market. To look more appealing to the PWDs, leading app developers are attempting to entertain users and promote positivity – integrate gamified challenges encouraging the user to get back and collect points for in-app activity, and have a feed of diabetes related lifestyle content to read, watch, like and comment. In 2017 leading app developers know very well that the app must be engaging, intuitive and beautiful. It is no longer enough to only aggregate and display data report on the smartphone screen. Otherwise the app will suffer from poor user retention. – Low adoption rates of Bluetooth enabled devices. Many of the BGMs and pumps on the market offer no other connectivity than cable uploads to their own proprietary software via a PC (if available at all). To import data from certain diabetes devices, app developers even have to release their own hardware- adaptors and connectors or hack the devices. – The devices which do offer Bluetooth connectivity often require the use of the proprietary applications that may not be user friendly, their functionality is basic, and connectivity issues are often reported by their users. – Facing long development/integration cycles when working with device vendors- app developers need to approach device manufacturers individually and close partnership deals to integrate with their devices and APIs. It can take months to negotiate deals for API integration, and develop the tools that device manufacturers may not see as 3rd party app connectivity is their key strategic priority. On a side note, the way the developers resolve the hassles of nutrition and medication tracking also heavily affects the overall user experience. For instance, carb logging requires manual input as there is simply no sophisticated technology to automate nutrition tracking on the market. Today, best-in-class apps provide comprehensive nutrition databases that tell user the nutritional content after scanning the barcode, or allows them to search for restaurant menu items, or popular meals by their names. Ability to save one’s go-to meals and log them with a single tap also makes logging easier. Medication tracking can also be assisted – for example, a unique feature is offered by One Drop – automated medication schedule that requires daily confirmation only. All in all, offering seamless diabetes device data flow is a crucial element to stay competitive these days. Current market leading diabetes care developers have at least partially overcome some of the obstacles mentioned above, and have developed multiple pathways to assist users in uploading real-time or retrospective data onto mobile platforms. By now, successful mobile diabetes care companies have invested a lot of effort to acquire data conveniently from key devices available on the market, but still face multiple obstacles when acquiring user data. As a solution to the problem of the lack of data interoperability on the market, diabetes care companies are coming up with their own proprietary device offerings. In this case, app developers are also in control of the hardware, and are in control of the user experience by providing easier data upload. Also, less hassle having to sync multiple app accounts, or uploading data via various channels. But, according to these companies, it may prove challenging to get PWDs to replace their current choice of device (which is often reimbursed by healthcare providers) with new ones. Blood glucose meters need to have exclusive design features and functionality to compete – sleek design like One Drop Chrome, or touchscreen functionality and cellular connectivity like Livongo’s InTouch meter – and attractive pricing for blood glucose test strip subscription plans. To get PWDs to switch to proprietary devices, providers must bundle unlimited test strip subscription offers. Usually, under traditional healthcare plans, PWDs face limitations on testing supplies provided by their healthcare providers and if they want to test more often, they are required to pay out-of-pocket. Diabetes app service providers make their bundle deals more attractively by promising unlimited, hassle-free test supplies delivered via mail. Providing the user with the freedom of testing as much they need, is aimed at providing a better insight into their glycaemic control. Once companies have acquired large amounts of diabetes and contextual data aggregation on mobile platforms, then the goal is to deliver actionable, positive and motivating insights to the users. 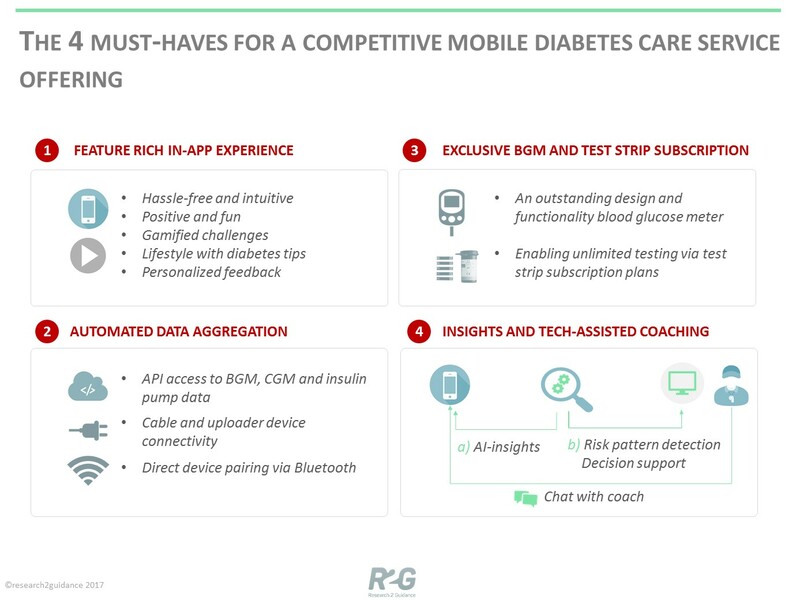 While there is a lot of buzz and hope in the mHealth and digital health community for AI insights into diabetes data, so far, diabetes app companies achieved very limited success with developing meaningful, personalized recommendations based only on AI. Today, sophisticated algorithms already exist on the market and help to translate various graphs, charts and logbook views into actionable insights, such as highlighting time of the day and day of the week, certain meal effect on blood glucose patterns or certain events when poor glycaemic control persists. But as of yet, the apps seem to lack the ability to approach users personally with actionable suggestions, and PWDs seem to still prefer a human coaching element. The ability to chat anytime with a diabetes expert and receive lifestyle advice appears to be a major motivation for PWDs to come back and use the applications. So before AI algorithms are advanced enough and prove that they can live up to industry expectations, developers are providing coaching by live experts. Such experts usually go over one’s data to identify risks or simply answers questions one has about their daily management. However, limitations to scalability of the coaches remains a key issue, and it is likely that within the next couple of years, app developers will advance their AI algorithms to replace the human coaching. Before such a time comes, app companies can offer AI assisted population management tools that improve the efficiency of coaches. The software for coaches usually offers population management tools, reports patient data, suggests risk patterns and facilitates messaging. To develop such tools, companies work closely with Certified Diabetes Educators or to understand and improve their workflow so that a single coach can manage a patient population of a couple of thousand PWDs successfully. In 2017, it will be crucial to empower People With Diabetes (PWDs) to self-manage their condition. It is no longer enough to only provide personal diabetes data tracking and reporting capabilities via a mobile app. Staying competitive on the diabetes app market is not an easy task because of the many elements app companies need to include into their service offering. Without feature rich user experience, the app will struggle to retain users; without automated data upload, patient data may not be sufficient for analysis; without a proprietary device offering, the user may be put off from testing as often as necessary; and without personalized insights, the end users may lack the education and motivation needed to manage their condition. If you want to know more about the other diabetes care mHealth app offerings, check out our Digital Diabetes Care Market 2018-2022: Ready To Take Off Report. Would you agree that only if all 4 elements of the product and service offerings are executed well, digital health companies focusing on diabetes care will succeed at both improving patient outcomes monetizing their mHealth apps? Let us know below!